Click on "Raise" to move the items in the row up one. Click on "Lower" to move the items in the row down one. the above are particularly useful in the Noticeboard section as the top two rows contain the items that are displayed at the top of your Home Page. 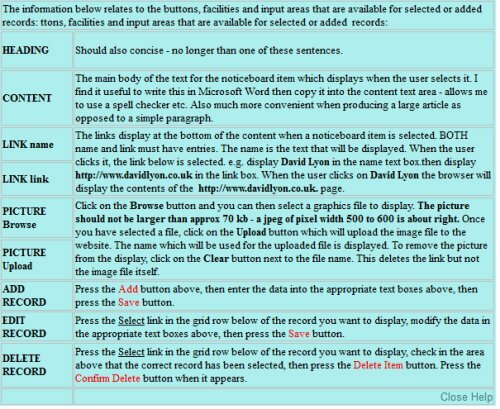 Click on "Select" to display the editing area as described below (very similar to the Add function below). 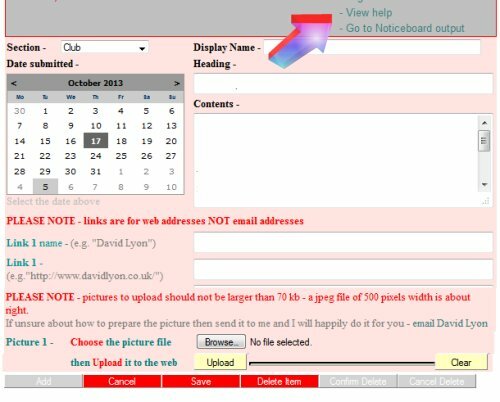 Click the add button will display an area of input boxes described below. If, after clicking the help link, you cannot see the help matrix then just browse down the page. The matrix usually opens below the editing area but above the list. The help section will explain detail relating to the particular area you are editing. So, click on editing page's help link!!! Use it.